During the last year or so of college my wife and I threw around the idea of owning investment property in our college town. During our college career we had both seen our fair share of horrible landlords (if there were any) and dumpy homes that were never maintained. We told ourselves that we would make great property owners and that we could easily maintain a nice looking home that could be rented out to four or six college kids. If we maintained the property, we were convinced that we could charge a bit more than the dumps in the neighborhood and still attract tenants. Now that we’ve left that college town and are actually considering our investment options, it’s time to seriously consider an investment in student housing – but is it a good idea? Apparently off-campus student properties are providing good returns around southeastern and southwestern campuses, especially at public universities. But taking what you know about college students, would you want to maintain a house full of them? One expert in the field of student housing ownership, Michael Zaransky, states “that for at least 20 years there will be a boom in the population turning 18 and a large percentage of them are choosing to go to college.” But do a large number of college students automatically mean that student housing is a good investment? One suggestion is that your individual investment decisions should be made first on the ratio of university-owned beds to total enrolled students. The lower the ratio for the campus, the greater need for privately constructed student housing – and the greater demand for your off-campus property. Another suggestion is to purchase property for your own children while they attend college. To help you purchase this type of student housing, the Federal Housing Administration offers something called a â€˜kiddie condo loanâ€™. This loan program is designed to allow both students and non-students to purchase a home with a blood-relativeâ€™s good credit standing and cash, according to MSNBC. These homes qualify for all tax advantages of a primary residence and require only 3 percent down. The owner-child can build a positive credit history as they escape from university dorm life. But what happens when your son’s roommates are late on the rent? Can you deal with that awkward situation? Although my wife and I are still researching the subject, student housing still looks to be a good real estate investment. Student housing properties bring in a steady positive cash flow (even after maintenance and insurance) and can even bring in enough to cover your mortgages. But when looking for college towns to invest in, look for areas with increasing rent prices that you can take advantage of – even if your child will never attend that school. What I’d look for additionally are areas around univerrsities that have more graduate students than undergrads. Graduate students are always there at least 2 years, and are quieter and neater too. I wouldn’t want to rent to undergrads unless the opportunity was really good – they are likely to move every year and don’t have stipends like grad students. My husband and I bought a 2 bedroom condo, about 1,000 sq. ft +/- near the University of South Florida. We had it for 4 years. Same two students the entire time. We sold it for 40K more than we bought it. Good investment – you do the math? We are just about ready to roll out a site addressing this very issue. Thanks for the link. FHA loans are available…”kiddie condos” allow the parents to purchase NON-owner occumpied co-borrower with 3% down. Yes, We think that student housing a very good invevestments. http://www.StudentRent.com – Your source for off campus housing! Free housing search, very affordable listings! I run an estate agency in Bangkok, and here I would say that student housing is not a good investment. Yes there is easily enough supply and your occupancy rates would be 99%-100% all the time, but the amounts received are just too small to get out of bed in the morning, with rentals for studio rooms being around US$40 per month. Over here, the luxury high-end market gets the best yields. In Bangkok the returns on student housing are so low that it isn’t worth making the investment, with students renting studio units for around US$40 per month. High-end luxury apartments get the best yields here. Students here in Schenectady, NY reserve their housing almost a year in advance. It’s October now, and I am already signing leases for the 2008-2009 academic year. Students sign 1-year leases, even if they will only live in their apartment for 10 months. Parents co-sign, and parties are prohibited. I’ve been doing this for 20 years, and think it’s the only way to go. Good idea steady stem of regular tenants. Risk is over supply unless University expands campus. If you do not have a house in or near Big Rapids your student will be charged the following rate for housing! If you divide this by the 9-month school year it equals $850.00 per month. If you own a home in Big Rapids your student can live off campus immediately, â€œBUTâ€ you have to show this address as the studentâ€™s home address when he or she applies to FSU. I have a property in Big Rapids that I would like to sell. We purchased this property for family members attending FSU that have now graduated. This property is leased through August of 2009 for $1,000 per month. Tenants pay all utilities. This rental unit is four bedrooms with three baths and is located several blocks from FSU. Appliances have all been replaced within the past three years and there is plenty of paved parking. Property was renovated in 2002. 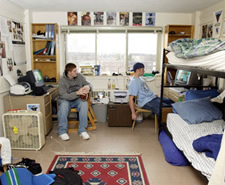 We lease to one student and that student sublets rooms to three other students. We receive our rent check and we pay only mortgage, taxes, insurance, and summer lawn maintenance. If you are interested in saving dormitory costs, you must use a Big Rapids address as your studentâ€™s home address when they apply to FSU. Student housing is a great investment if you know what you are doing, if you don’t you can get clobbered like many of the folks I’ve bought properties from- most competely mismanaged it and took a sound beating- doesn’t make them bad people, just people that did not know what they were doing. Looking for free rental advertising? Try StudentRent.com! They are offering free housing search nationwide and several free listing opportunities for property managers. The university is never going to move, so you should be guaranteed of finding a tenant for life! My husband and I personally own a condo apartment in a university town. With 5 bedrooms and two floors, we have an amazing unit. After all the bills (tenants pay all utilities) we pocket $900.00 each and every month.